Earlier this week, a massive dust storm darkened the skies of Lubbock, Texas. Wind gusts reached 70-mph and the cloud of dust climbed 8,000 feet into the air. This type of intense dust storm is called a haboob. They are usually seen in arid climates when the strong downdraft of a thunderstorm reaches the ground and blows the dry loose sand up into the air. We have seen a few of these in Arizona recently. The Texas haboob, however, had different origins. It was caused by the fast moving winds of the leading edge of an approaching cold front. The Lubbock dust storm was a by-product of the extreme drought that has been plaguing most of Texas. Without rain, crops have dried up and large tracts of land have been left barren. Lacking the stabilizing roots of natural prairie grasses and commercial crops, the dry soil is highly subject to wind erosion. The images of this huge dust storm and the drought that caused it are reminiscent of the Dust Bowl storms of the Great Depression. 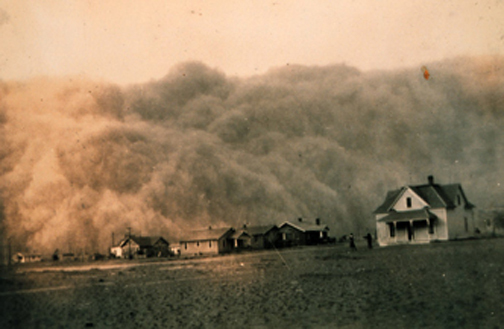 Throughout the early 1930’s, a severe drought in Kansas, Oklahoma, and Texas caused huge dust storms that damaged both the ecology and agricultural industry of the great plains. Unfortunately, there is no end in sight for the current drought in Texas. As a result, we could see more dust storms in that state. This entry was posted in weather and tagged national, storms, wind by Melissa Fleming. Bookmark the permalink.